From the mind of Ted Rechlin, author and illustrator of Jurassic and Dinosaurs Live comes the thrilling new epoch-spanning adventure Sharks, a life-science graphic novel adventure. Sharks have been cruising our planet's waters for millions of years. They were here long before humanity and even pre-date the dinosaurs. Rechlin weaves a captivating history of strange and ancient shark species while sharing insights into the distant past of life on Earth. The amazing and action-packed art teaches readers of all ages how these legendary ocean dwellers got their start - and how they developed into the sharks we know today. 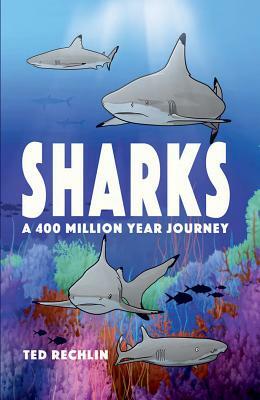 Educational, fascinating, and beautifully produced, this is the perfect book for budding marine biologists, comic fans, and enthusiasts of these ancient apex predators of the deep. > Newest installment in series of educational, IMAX-style adventure comics that includes Tyrannosaurus Rex, Bears, Jurassic and more. > Full-color illustrations engage readers ages 6 and up in a beautiful hardbound format.